Thinking of spring and mud puddles and skipping led me to think about Easter. Crisply ironed dresses with crinolines… and white straw Easter bonnets with ribbons down the back and an elastic under the chin. 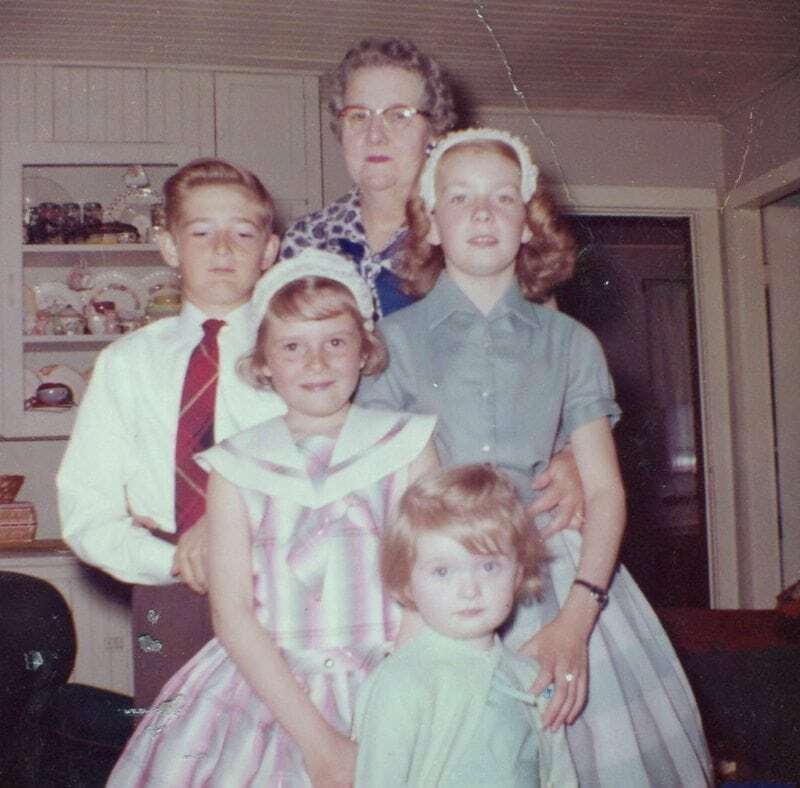 That’s me, above, circa 1958, with my grandmother, brother and my two older sisters in their Easter bonnets. But where is my bonnet? I know I had one because I remember unpacking it from the cedar chest and holding it reverently in anticipation of Easter morning. My memories of childhood Easter mornings are vivid, as they are for many of us I’m sure. Easter baskets and chocolate eggs. Easter bonnets. Maybe a new dress and shiny shoes. White gloves for Sunday school and a small bible with a white zippered cover into which we slipped a carefully folded tissue and a dime for the collection plate. But Easter in Canada is not a guarantee of warm temperatures. And even if the snow has gone, the ground might not be dry enough for shiny new shoes. One year when the snow and mud in the yard made wearing new shoes impossible, I remember tap dancing on our cement front step in new, red mary janes. I recall a moment of perfect happiness, doing my little dance in my new shoes on that small square of concrete in the sunshine. Then decamping inside to put my old winter boots on before I dared to venture further. Funny how that moment in the sunshine in my new shoes has always stayed with me. This is a picture of my sister’s three children taken on Easter morning, 1986. My niece Elisabeth, in her bonnet, is chortling merrily, clearly entertaining her brother. But what I love most about this picture is how Elisabeth’s older sister, Rebecca, is not amused. Obviously she feels that wearing one’s Easter finery calls for a bit more dignity. I love these stories! I can just see your new red shoes. And totally know what it’s like to have too much mud to wear them. Although that may or may not have stopped me . . .
Oh, Sue. Your memories of childhood and Easter are so much like mine. I’ll be publishing my memories on Friday. I hope you pop by. Michigan rarely promised a warm Easter for us, either. By the way, you were an adorable toddler. Thanks, Adela. I will be sure to pop by. Hope we at least get a little sunshine this year. What wonderful memories. I would have loved red Mary Janes and always loved how everyone would dress up to the nines. I miss my red mary-janes. And white gloves. I always loved the white cotton gloves we wore to church. YES, I too have fond memories of EASTER Mornings! I received a TEXT from my 28 year old yesterday confirming EASTER DINNER but wanting an EGG HUNT FIRST!!!!!!!!! THAT gave me the BIGGEST SMILE INSIDE!